It seems that, as long as humans have been aware of death, they’ve entertained the possibility of staving it off and living forever. It’s highly unlikely that this could ever be achieved, since everything has to wear out eventually. Actually, in religion and mythology, there are different kinds of immortality. A lot of the time, eternal life plays out in a different plane of existence. Greek mythology had several stories of people who became gods when they died on Earth, and the same theme was present in other mythologies. Similarly, Christianity holds that the afterlife is eternal, at least if you make it to Heaven, but sometimes for the people in Hell as well. For the purposes of this post, I’m more interested in physical immortality, which is to say the eternal persistence of the human body on Earth. One example of physical immortality that comes to mind is that of Utnapishtim from the Epic of Gilgamesh. In most ways, what we know of this character shows him as pretty much the same as Noah from the Bible. Acting on the advice of the god Ea, he built a boat in order to survive a worldwide flood, and brought his family and some animals on board with him. Indeed, the story is so similar that the Genesis tale is quite likely a modified version of the Mesopotamian myth. But while the Bible tells us that Noah died at the ripe old age of 950, Utnapishtim is said to have been made immortal by the gods, and Gilgamesh visited him to learn how to become immortal himself. In Greek mythology, there’s the story of Tithonus, son of King Laomedon of Troy and the water nymph Strymo. He was the lover of Eos, Titaness of the Dawn, and she petitioned Zeus to make him immortal. The thunderer found a loophole, however, and made Tithonus immortal but not eternally young. Hence, he just kept aging, and eventually couldn’t do anything but talk. Some versions of the myth say that Eos eventually turned him into an insect, and he remained in that form forever. I’ve seen his bug form referred to as a grasshopper, a cicada, and a cockroach. 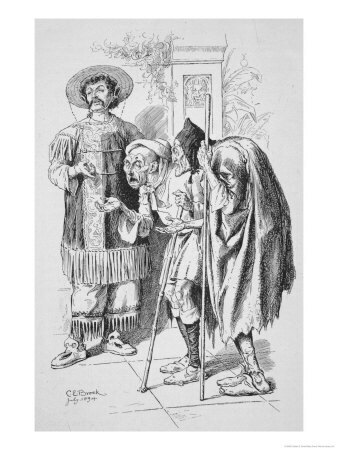 The idea of someone being immortal but continuing to age was later used for the struldbrugs of Luggnagg in Gulliver’s Travels. 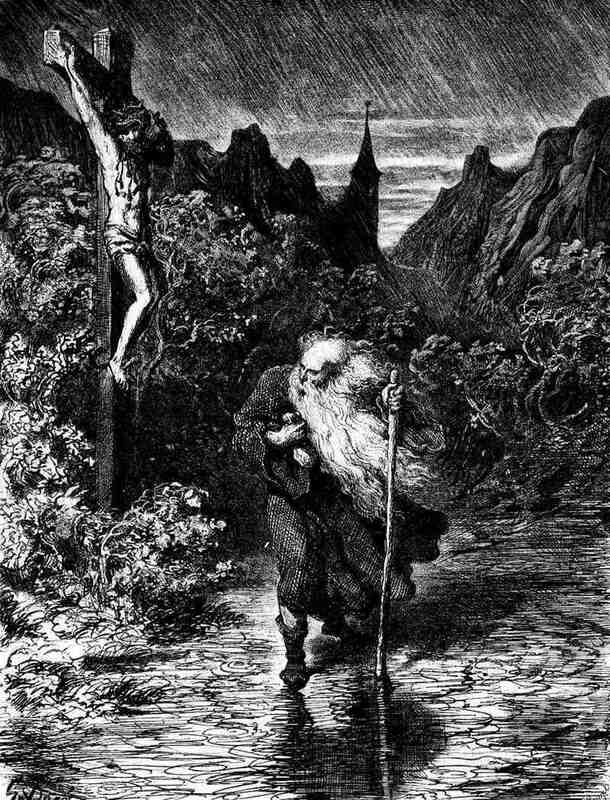 Christian mythology, presumably dating back the the thirteenth century, includes the legend of the Wandering Jew. Basically, this guy mocked Jesus for walking so slowly while carrying the cross, so Christ cursed him to wander the world until the Second Coming. The most common name for this man was Ahasver or Ahasuerus, and his occupation varies from one telling to another. He’s often a shoemaker, but other times a porter for Pontius Pilate or a member of the Sanhedrin. It’s said that he eventually converted to Christianity (I guess Jesus’ curse was proof enough that he was the Messiah), and has spent the time since as an ascetic preacher. People reported sightings of this wanderer as far back as the sixteenth century, but they were most common in the nineteenth. I’ve seen the legend of the Wandering Jew linked with stories that some of the original apostles are still alive, in order to make Matthew 16:28 fit with the idea of the Second Coming being in the future. If Jesus said that some people standing with him wouldn’t die until after the establishment of Christ’s kingdom on Earth, and he’s always right, some of them would still have to be alive, right? It strikes me as a pretty desperate attempt to explain away Jesus’ belief that his return would be very soon after his departure, but it makes for some interesting stories. Shia Islam has a similar legend in that of Muhammad al-Mahdi, the Twelfth Imam, who is said to have been alive since 869 but hidden by Allah. According to believers, the imam will return at the end of the world, along with Jesus. This entry was posted in Babylonian, Christianity, Greek Mythology, Islam, Mythology, Religion and tagged afterlife, ahasuerus, bible, ea, eos, epic of gilgamesh, flood, genesis, gilgamesh, gospel of matthew, gulliver's travels, heaven, hell, immortality, jesus, jonathan swift, king laomedon of troy, luggnagg, muhammad al-mahdi, noah, nymphs, pontius pilate, sanhedrin, second coming, struldbruggs, strymo, titans, tithonus, twelfth imam, utnapishtim, wandering jew, zeus. Bookmark the permalink. You might be interested in the Ba Xian, Chinese for “Eight Immortals”, sometimes written as Pa Hsien (in the older Chinese transliteration system). They’re basically a superhero team of ancient China. Well, not exactly, but it’s eight ancient Chinese citizens who managed to achieve physical immortality; but, of course, in Chinese Taoist mythology, just because you have a physical form doesn’t mean you can’t travel throughout the spirit world at your will. None of them really had a connection while still mortal (maybe one of them was another’s student/disciple, but that’s about it), but these days they form all sorts of groups–usually all eight of them at once but occasionally in pairs. There’s six men, one woman, and one immortal who’s rather like Chick the Incubator Baby, no one knows for sure what he/she is, and he/she isn’t telling. I actually mentioned them in this post, although I didn’t go into much detail.